The next SAC meeting will be held on 19 January 2011 at the Holiday Inn in Rockland, MA (9:00 AM-3:30 PM). The sanctuary is seeking applicants for the following seats on the Stellwagen Bank National Marine Sanctuary Advisory Council: (1) At- Large Alternate seat and (1) Maritime Heritage Member and (1) Maritime Heritage Alternate seat. For additional information, please contact Elizabeth Stokes or Nathalie Ward. The Massachusetts Marine Educators and Stellwagen Bank National Marine Sanctuary announce the 2011 Marine Art Contest for students in grades K-12. The contest deadline is April 28, 2011. Students may submit their artwork in one of five divisions: elementary (grades K-4), middle school (grades 5-8), high school (grades 9-12), scientific illustration (all grades) and computer graphics/photography (all grades). There is no charge for this contest and all students (public, private, homeschool, afterschool) are welcome to participate. Click here for a brochure and entry form for the contest. A traveling art show of the winning entries from the 2010 contest will be on display until the end of January in the JFK Building in Boston and at the Salem National Historic Site Visitor Center in Salem, Mass. throughout the month of February. The sanctuary is partnering with Massasoit Community College to offer a four-week FREE mini course introducing high school and college students to a variety of marine careers. The lectures will be offered on Tuesday nights from 6:30pm-8:30pm, Nov. 2, 9, 16 and 23. For more information, contact the sanctuary at 781-545-8026. Click here for the information brochure! SBNMS is recruiting for new members for our Sanctuary Advisory Council (SAC). Completed SAC applications must be received by close of business 19 November 2010 at Stellwagen National Marine Sanctuary Office, 175 Edward Foster Road, Scituate, MA 02066 or emailed to: Elizabeth.Stokes@noaa.gov or faxed to: 781-545-8036. See attached application package, which includes the application, SBNMS Charter and Federal Register Notice. For additional information please contact: Elizabeth Stokes 781-545-8026 x 201 or Nathalie Ward, SAC Coordinator, Nathalie.Ward@noaa.gov. Download the Application, the Charter and the Federal Register Notice. The sanctuary has announced the selection of seven individuals to primary seats on the Advisory Council and three alternate members. Click here to learn more about these appointments. SBNMS SEEKS NEW ADVISORY COUNCIL MEMBERS: DEADLINE EXTENDED TO 11 OCT.
SBNMS is recruiting for new members for our Sanctuary Advisory Council (SAC). New Council seats include: one primary member seat representing Conservation; and for alternate member seats representing Conservation, At-Large, Whale Watching, Education, and Mobile Gear Commercial Fishing. Completed SAC applications must be received by close of business 11 October 2010 at Stellwagen National Marine Sanctuary Office, 175 Edward Foster Road, Scituate, MA 02066 or emailed to: Elizabeth.Stokes@noaa.gov or faxed to: 781-545-8036. See attached application package, which includes the application, SBNMS Charter and Federal Register Notice. For additional information please contact: Elizabeth Stokes 781-545-8026 x 201 or Nathalie Ward, SAC Coordinator, Nathalie.Ward@noaa.gov. 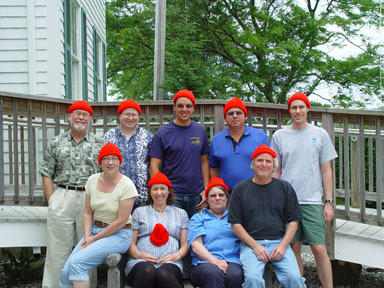 To celebrate researcher and explorer Jacques Cousteau's (1910-1997) life, the staff at the Stellwagen Bank National Marine Sanctuaries donned Cousteau's famous red hat. To kick off National Safe Boating Week (May 22-28), the sanctuary asked the U.S. Coast Guard Auxiliary to undertake a vessel safety check on the Research Vessel Auk. These free inspections are offered to the public as a means of increasing boater safety. The RV Auk passed with flying colors. Click here to read a press release about the vessel safety check program. The 2010 whale watching season is now upon us. The sanctuary asks that individuals wishing to view whales in their natural environment take precautions to keep themselves and the animals safe and healthy. Click here for our press release about safe whale watching. The National Marine Sanctuaries' 2009 Accomplishment report has been released. The Stellwagen Bank National Marine Sanctuary was featured prominently in this report which highlights our accoustics research, maritime heritage program, and Dave Wiley's Gold Medal Award from the Department of Commerce. Or Click here to download the report directly. SBNMS is seeking applicants for the following seats on its Sanctuary Advisory Council: For two-year terms for member (M) and alternate (A) seats for: (1) Research (M&A), (1) Conservation (M&A), (1) Whalewatching (M&A), (1) Fixed Gear Commercial Fishing (M&A), (1) Diving (M&A), (1) At-Large (M&A), (1) Education (A), and, (1) Business and Industry (M)). Additionally, three-year terms for: (1) Conservation (M), (1) Mobile Gear Commercial Fishing (A). To view the press release announcement click here. For a full Council list, please see SAC Members (PDF). The 2010 Marine Art Contest, jointly sponsored by the Massachusetts Marine Educators, the sanctuary and several other regional organizations, is now underway. Students in grades K-12 are invited to submit artwork that showcases "Amazing Ocean Creatures of Stellwagen Bank National Marine Sanctuary and the Gulf of Maine." Click here to obtain more information about the contest and an entry form. Dave Wiley, research coordinator for Stellwagen Bank National Marine Sanctuary, has been awarded a Gold Medal by the Secretary of Commerce for his leadership in designing and implementing innovative research projects to protect endangered whales in and around the sanctuary. The Gold Medal is the Commerce Department’s highest honorary award, presented annually for distinguished performance in support of the department’s critical objectives. Click here for press release. The sanctuary is now in the process of developing its Final Management Plan. Click here to view the Draft Management Plan and the collected public comments. Click here for a short guide to the plan!